Today is August 1st and it is hot. It's the kind of hot, summer day that makes you want to sit under the shadiest tree you can find and sip iced tea or lemonade. It's not a day for cooking and certainly not a day for turning on the oven, but what do I do? 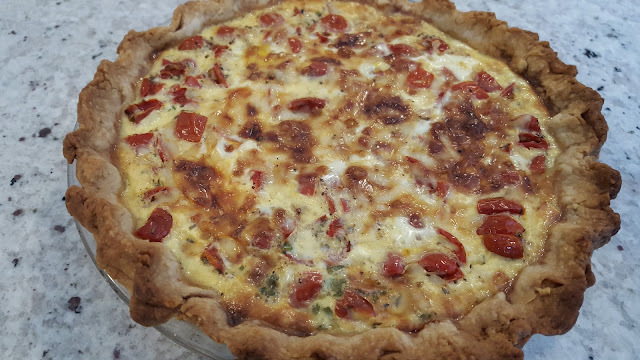 I decide a tomato and corn quiche would be perfect for dinner tonight. There's no way around it, a quiche requires the oven and once I get something in my head I'm not easily dissuaded. I love quiche. To me, quiche is the perfect any time of day meal. It works for breakfast, lunch, and dinner. It is also perfect because it is a "dump" recipe. Just "dump" the ingredients into a crust and you are halfway there. Forty-five or so minutes of oven time later, you have a meal. A quiche is a perfect meal to use up whatever you may have in your refrigerator. Today's quiche is inspired by my friend Lydia Walshin's recipe for tomato pie that you can find in her book, 25 Tomatoes: Easy year-round recipes using fresh, canned, roasted and sun-dried tomatoes from the Perfect Pantry kitchen. My garden tomatoes are not yet ready, but I had a pint of flavorful grape tomatoes that I decided to cut into quarters. 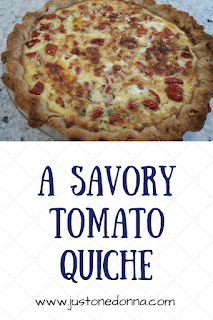 Tossed with a little salt and pepper and a generous spoonful of pizza seasoning, those tomatoes made a wonderful base for this quiche's flavors. My garden has produced a bounty of beautiful red onions. One chopped, red onion, tossed with a generous handful of chopped parsley from a pot on my deck, and some salt and pepper finalized the savory components of the quiche. Frozen corn was added for sweetness and color. I must say, this combination is a feast for the eyes. 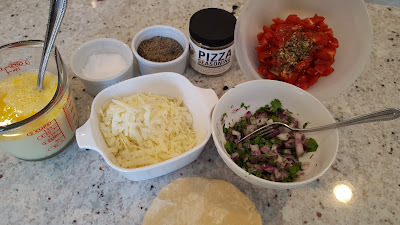 You can use a frozen pie crust from the grocery store if you wish, but I made a quick food processor pie crust which I blind baked before assembling the quiche. Today, my cheese of choice was baby Swiss cheese, but your favorite cheddar cheese will be yummy in this recipe as well. Use any cheese or combination of cheeses you like. Three eggs, lightly beaten into one cup of milk (today I used 1/2 cup of fat-free half and half with 1/2 cup of skim milk) is the perfect amount of liquid to fit the standard 9-inch pie plate I used. If you choose to use a deep dish pie plate you'll want to increase either the liquid, or vegetables, or both. Assembling the tomato quiche is quick and easy. Layer half of the cheese over the base of the blind-baked pie crust. Then layer the onion and corn mixture. Next added the tomato mixture and the rest of the cheese. Finally, pour the egg mixture over the filling. Bake until the mixture is set and lightly browned, about 45-50 minutes in your 400-degree F oven. Cool and chill until you are ready to serve. I'll be pairing my quiche with a Ceasar salad for dinner. Yummy! Preheat your oven to 400 degrees F. Blind bake your pie crust until just beginning to color, about 15 minutes. Prepare your quiche filling. Mix the eggs and milk together in a small bowl using a whisk or a fork. Chop the onion and parsley. Toss them together in a small bowl. Add the frozen corn and set aside. Quarter the grape tomatoes and toss with the pizza seasoning. Once the pie crust is ready, spread half the cheese over the base of the crust. Then add the onion mixture. Top with the tomatoes and the rest of the cheese. Pour the egg mixture over the filling. Bake for 45 minutes or until the center is set and the cheese is beginning to brown. Cool, and refrigerate until ready to serve. Like all quiche recipes, you can vary the ingredients to your heart's content. Add some crumbled cooked bacon and you'll add additional flavor. Do you want Tex-Mex flavor? Add some chopped fresh jalapeños and substitute 1/2 teaspoon of chili powder and 1/2 teaspoon of cumin for the pizza seasoning. Use a blend of Mexican cheeses. Thanks for the shout-out for my e-book! I love serving tomato quiche (or tomato pie) for brunch, with salad -- such a glorious way to start a hot summer day. I love your books, Lydia. Looking forward to the next one!